Eric Dinallo is Executive Vice President and General Counsel of The Guardian Life Insurance Company of America. In this role, he is responsible for leading Guardian’s Legal, Regulatory, Compliance and Government Relations functions, in addition to all corporate governance activities. Mr. Dinallo has a broad range of public and private sector experience. Most recently, he co-led the insurance group of the law firm Debevoise & Plimpton LLP, where he represented financial services firms on regulatory, compliance, litigation and transactional issues. 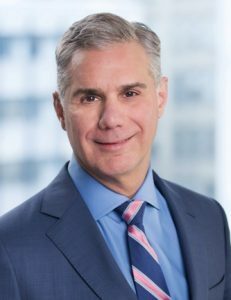 His prior experience includes senior-level leadership positions as Superintendent of Insurance for New York State, Global Head of Regulatory Affairs at Morgan Stanley and General Counsel at Willis Group Holdings. As Superintendent of Insurance, Mr. Dinallo has been credited for helping to lead New York and the insurance industry through the financial crisis. Active across the industry, Mr. Dinallo serves on the Board of Directors of the American Institute for Stuttering and Nazareth Housing, a non-for-profit committed to finding supportive and emergency housing for families in need. Mr. Dinallo has a bachelor’s of arts degree in philosophy from Vassar College, a master of arts from Duke University School of Public Policy and a Juris Doctor from New York University School of Law.